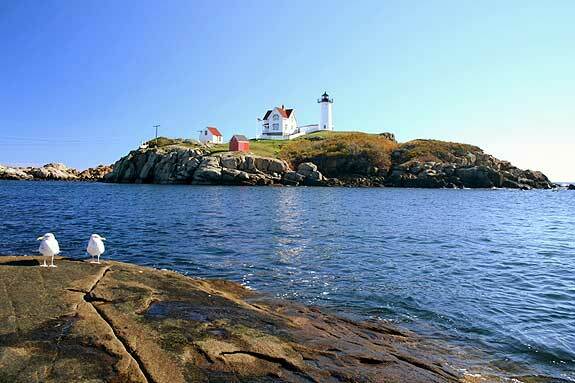 Nubble Lighthouse in Cape Neddick, Maine is a popular spot for wedding ceremonies. One of the most important things on your wedding to-do list is finding a wedding officiant. This, like all things wedding, depends on your personal preference. Do you want a church wedding or one in the great outdoors? Are there special religious traditions that are important, or are you thinking of something more secular? Maine offers a number of wedding officiants. Some of them are even willing to follow you to the top of Cadillac Mountain or out on a whale watching cruise. The possibilities are only limited by your imagination. A wedding officiant, or marriage officiant, is a person who presides over the wedding ceremony. The term is most often used for civil officers, such as a justice of the peace, rather than members of the clergy. In the United States, Canada and various countries around the world religious “officiants” are usually called celebrants. To make things even more confusing, the terms are often interchangeable. Usually priests, rabbis, imams and other religious leaders performing a wedding ceremony in a house of worship are referred to as celebrants, because they are celebrating a religious ritual. While some religious leaders will perform ceremonies outside of religious venues, others will not. In the Jewish faith, as long as a couple is married under a canopy, the wedding can be inside or out. The term officiant covers a lot more territory. They perform civil wedding ceremonies on beaches, aboard boats, in parks, at hotels, in private homes; just about anywhere you can imagine having a wedding. In Maine lighthouses are a signature wedding location. People often get married on cruise ships with the captain acting as officiant. Contrary to popular belief, that captain is usually a justice of the peace or a minister of some sort. Laws vary between cruise lines and the ship’s country of registry. It may also depend on the citizenship of the wedding couple. For example, Japanese ship captains may legally marry people only if they carry a Japanese passport. Princess Cruise Lines spends a great deal of time in Bermuda. Most of the captains have special licenses to marry couples in Bermuda waters, as long as the couple can prove they are at least 21 years of age. The first step to getting married in Maine is getting a marriage license. Your wedding officiant, religious or otherwise, will need this document. If both parties are residents of the state, then you should apply in either the bride’s or the groom’s home town. If only one party lives in Maine, then both parties apply in that town of residence. Couples from out of state may apply in any town office. All parties require photo ID, such as a driver’s license, which proves you are at least 18 years of age. Additional documentation is needed for parties that have prior marriages or who are underage. There is no required blood test and no waiting period. The licence, only valid in the State of Maine, is valid for 90 days from the date of issue. Currently the license is $15 per person. The certified copy of the marriage certificate is additional. Currently if you request the copy from the state, the fee is $10 for the first copy and $4 for each additional. If you go to a local office, the fee is $7 for the first copy and $3 for each additional. Marriages in Maine may be performed by ordained clergy, licensed ministers, judges or justices that are residents of Maine, lawyers that are members of the Maine Bar and Maine Notaries. The Quakers and those of the Bahai’i faith may marry themselves in traditional meetings and it is considered legal. Most wedding officiants are found in the more populated areas of Maine such as the Portland and Casco Bay area, Bangor or Augusta. Some, like Justice of the Peace Julie Draper in the Portland area, offer wedding services on the beach, with the scenic Nubble Lighthouse serving as a backdrop or in a more intimate home setting. All in One Weddings in Brunswick not only has an assortment of wedding officiates; the firm offers complete wedding packages. Depending on the number of guests and how elaborate your ceremony, packages typically start from just under $700 to around $1,300 with additional services available. They also offer an elopement package including a two night hotel stay. Think about it, you could actually take an impromptu trip to Maine, have a memorable weekend and then go back home and surprise everyone.